Does Your Hero Laugh in the Face of a Three Act Structure? Victoria Grefer over at Creative Writing with The Crimson League (one of my Versatile Blogger Award nominees) recently did a series on heroes. She covered the reluctant hero, the willing hero, the anti-hero, the misjudged hero, and a caveat on classifying your heroes. Throughout the posts, and especially in the comments section, a book title popped up again and again, The Hero with a Thousand Faces by Joseph Campbell. For those of you, like me, that did not get a degree in English or Literature, you might not have heard of Campbell or his book. I only stumbled across his name for the first time a month ago. However, if you’ve read a lot of fantasy and watched a lot of movies, chances are you’ve learned the lessons of his book without knowing it. You might even have written a novel following Campbell’s principles. I had. The Hero with a Thousand Faces is a book about myths. If you look through the history of myths throughout time and across cultures, they all share a similar structure. Myths deeply resonate with the reading public, even today. Yeah, yeah, academic stuff. Yawn. I’m writing page-turning fiction here, Lara. Who cares about dusty old myths? Speilberg, J.J. Abrams, Tolkien, J.K. Rowling, Iron Man, Superman—I’ll stop there or the rest of the post could be a listing of examples of successful movies and books that use Campbell’s structure, which is often just called the Hero’s Journey. Discovering the Hero’s Journey was a huge relief to me. I had been trying to shove my plot into a basic three or five act structure and it just wouldn’t fit, even after I sat on it and really tugged on the zipper. I could still make out the muffled voice of my heroine shouting snarky insults at me. If your hero is just as hard to wrangle into those basic plotting devices everyone keeps telling you about, maybe it’s because he/she wants to be a hero of mythic proportions. If so, let your hero go on a journey. The following outline appears in A Writer’s Guide to Fiction, and author Elizabeth Lyon even put it in a nice three act structure for us perfectionist rule followers. The Ordinary World/Hero at Home: Give your reader a little bit of normalcy before you send your hero off to face danger. Show them at work, with family, maybe even a current love interest. Make sure there’s still conflict. Just because they are at home, it doesn’t mean the story has to be boring. Call to Adventure/The Challenge: Okay, now things are getting interesting. Will the hero go to slay the dragon, solve the crime, or embrace that he now gets furry every full moon? Refusal of the Call/Elimination of the Expendable Person: Maybe your hero is ready to go right away, but the story is a lot more dramatic if he says no first. Then that not-right-for-them girlfriend can get killed and raise the stakes, making the hero that much more committed when they do answer the call. Meeting with the Mentor/Wise One: Your hero is about to enter into a strange new world and needs guidance. Where would Luke Skywalker have been without Obi Wan and later Yoda? Crossing the First Threshold into the Special World/Mythical Woods: In fantasy, a lot of times this actually means crossing into a new world. However, it doesn’t have to. If you write mysteries, it means crossing into the world of the killer. For romance, it could just mean entering the world of the love interest and all the vulnerability that entails. Road of Tests and Trials/Allies and Enemies: This is where you hit the real meat of any novel. You’re writing scenes of conflict between your protagonist and antagonist. Approach of the Inmost Cave: The hero and his allies are preparing for the big event, usually a major face off with the antagonist. Belly of the Whale/Meeting with the Goddess, Temptress; Atonement: This stage isn’t always listed, but adds another trial for your hero. Feeling mean? Throw a time of desperate solitude at him, or a temptress, or guilt, etc. right before he has the big battle. The Ordeal/Life and Death Struggle: Now your hero is ready to face death or his greatest fear. Often this is the first major battle with the villain. Reward: The hero usually gets something out of facing death. It can be a sacred object like a grail or a spell, or finally winning the love interest, or knowledge for the community, etc. Refusal of the Return/The Road Back: About three quarters of the way through the book, the hero wants to return home with the reward. The antagonist usually chases him. The Ultimate Test/Resurrection: This is your climax. Almost home, the hero has one last battle where he must make a sacrifice. He may or may not die, and whatever personal growth you’ve been working on throughout the story needs to be resolved here. The death/resurrection is usually metaphorical as the hero becomes a new person, but with fantasy sometimes he just might die and come back. Return with the Reward/Elixir/Master of Two Worlds: The hero makes it home and as he is changed, can now help change his community. Sometimes he answers a new call to adventure, also known as a sequel. Does your hero or heroine play nice with traditional plotting devices? 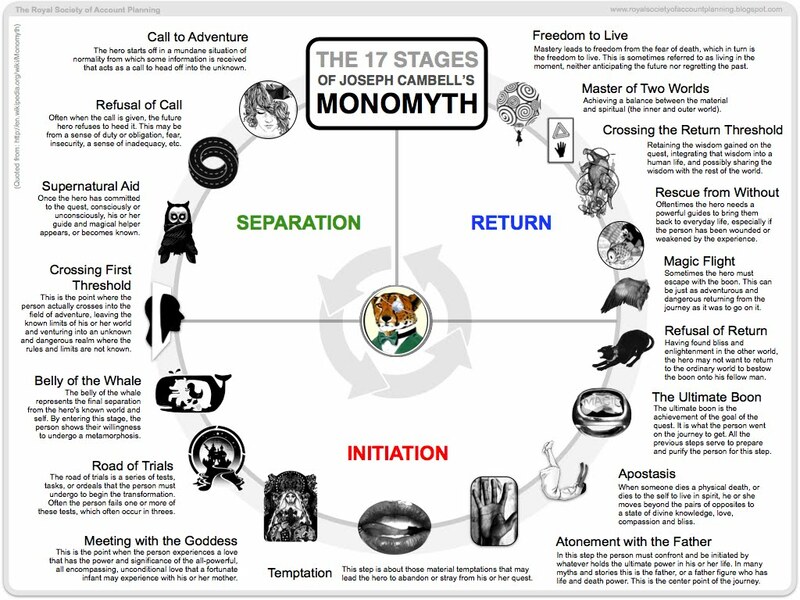 Does the myth structure fit you better, or have you found yet another way? The Heroine’s Journey (the first post of twelve) The blog takes an in depth look at Campbell’s structure using the 2011 film adaptation of Jane Eyre. Thanks. I think that might be the first time any one has excused me of putting anything succinctly. 🙂 I am forever lamenting how long my blog posts get. I set out to deliberately violate as many conventions of narrative structure as I could, and as it happens, that seems to be a very bad idea if your goal is to sell books. So I suspect that following a classical structure is a better plan. Perhaps you are just one of those authors that we will realize your genius thirty years from now. Perhaps you have pioneered the Catskinner 26-part structure or something. Thanks for the link, Lara. Great article! I was happy to find your post. I do not have the patience to write a long example of the Hero’s Journey, so was delighted to find you had already done it for those curious.